(CNN) - For those who thought '9-9-9' would disappear along with Herman Cain's suspended presidential campaign last month, the former pizza executive wants to prove them wrong. 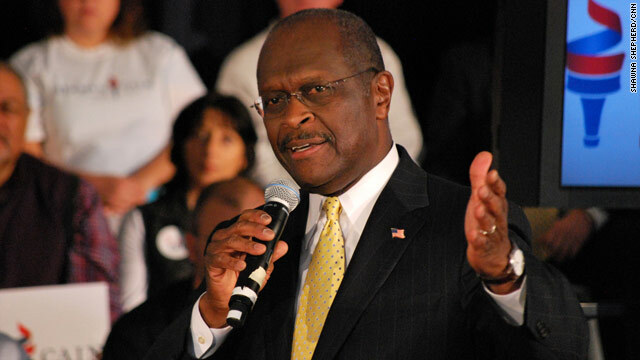 Cain announced Wednesday he plans to start what he calls "Cain's Solutions Revolution," a "movement" he hopes will spread many of his campaign ideas across the political landscape. "We're going to make the solutions the star," Cain said on Fox News, adding that he's dissatisfied with the quality of ideas so far introduced by the remaining candidates in the presidential cycle . Using a website and even a bus tour, Cain said he'll organize voters to urge their members of Congress to adopt Cain's famous tax plan as legislation. The plan proposes replacing the current tax system with a 9% income tax, 9% corporate tax rate and a new 9% national sales tax. Cain ended his presidential bid amid allegations of an extramarital affair and sexual harassment when he led the National Restaurant Association in the late 1990s. He must have a lot of money left over from his joke of a campaign. The only one who really thought his plan was good was, well, Cain himself. Mostly because everyone else, besides him, understood the plan and just how dumb it was and still is. Most of what he thought was a good idea was dumb. It probably sounds good to someone who makes pizza, but to a presidential candidate, oh wait, Cain did make pizza. There's quite a bit of difference between making pizza and running a country. Everyone knew that except for Cain. Translation: he wants to start a "think" tank, funded by wealthy interests, that will generate easy money for himself. It's the Republican way, and mistresses are expensive. Why isn't this criminal behind bars yet? Cain still refuses to believe IT'S OVER but I don't think he's really capable of comprehending so that explains it. Is this one of those palin bus tours to nowhere for no reason? Except for $$$. Regarding our Economy, 999 is better than Obama's crime! What makes him think his ideas are still relevant? i didn't like his ideas before...let me check... nope, still don't. hahahahahahahahahaa... if his ideas were so great, why isn't he still in the race... oh yeah... poor judgement. I remember now... so, you've got a good idea? Which one, the one where you run your hand up a woman's dress, or the one where you support a woman for 13 years without telling your wife? Of do you have other good ideas we haven't heard about? Just when you thought it was safe to go back in the water...............he is back. And dumber than ever. I bet there is a book to be sold along with this plan. This dude is just a media hog... has to have the spotlight on him. He has no idea good idea's he just has dollar signs in his eyes. Herb wants to fleece the sheep who fell for his simpleton plan. The idea of adding on a federal sales tax would hurt those that have less. If there were rules as to when it would kick in; such as on products that were over $1,000 or so, I'd have less of a problem with that. I also think that this would never get through Congress in any of its many forms. It would hurt the poor more. The raw number of how much someone would pay is something that should be looked at also. The percentage might be the same for all, but how it affects what the family or person can buy and save is dramatically different. This is all just behind the scenes jockeying for power. Rove wants to elect the next neocon robot, Flipper. Flipper is hated by a large number of people in the GOBP deathcult. Therefore, Rove needs to capture, leverage or extort conservative endorsements so he can turn around and use those endorsements to convince rightwing voters that they can trust and vote for the Robot Puppet. Variations on this dance will be played out over the months, and it will always end with some sort of perk or favor in exchange for an endorsement. Here, Cain (and/or his Koch-head backers) are using Cain's leverage as a person Rove will need to endorse Flipper. If Rove and his Robot Puppet can make a behind the scenes deal to support he Koch-head agenda, you'll suddenly see Cain endorse Flipper.